Jacob Christian Hansen Ellehammer was educated as a watch-maker, but soon got interested in various mechanical and electrical disciplines. He was a great inventor, and many of his inventions were literally way ahead of his time. He made his money on a revolutionary water pump, and the got interested in light combustion engines. He soon married the combustion engine to a bicycle frame, and his “Elleham” motorcycle became a huge success. Around 1903-1904, he started the development of a light aircraft engine. The idea of more than one cylinder was not new, but to save weight, he came up with the idea of mounting all the cylinders in a circle around a common crank case, thereby reducing the weight substantially. This, the worlds first radial engine, had 3 cylinders and produced 9 horse power. By 1906, he had managed to increase the power output by a factor of 2.5, and his model 1906, 3-cylinder engine produced slightly over 20 horse power. Ellehammer and his brother had played with kites as children, and he knew they could produced enough lift to carry himself, on a windy day. So, he based his first aircraft on a triangular kite design. This was his second stroke of genius. By basing the design on a kite, the weight of the aircraft was drastically reduced, as he did not need heavy wooden wing spars and wing ribs, but could make do with a few metal tubes. The first Ellehammer aircraft were probably what we, today, would call hang-gliders, rather than fixed-wing aircraft. During his experiments, he added a second wing, tied to the first one with ropes. The top wing did not have any metal frames, and was, in fact, acting much like a ships sail. This was his 3rd stroke of genius. In effect, he got twice the lift, but added only 3.5 kg (7 lbs) of weight. He then turned his attention to stability and control. Again, he came up with a brilliant idea. Longitudinal stability was controlled automatically by a pendulum that always pointed downwards, linked to the elevators. When the nose of the aircraft dipped, the pendulum would swing forward, pulling on the elevators, until the aircraft’s nose went up again. The opposite would obviously happen when the nose went up. Lateral stability was done by shifting the weight from side to side, bending the wings. 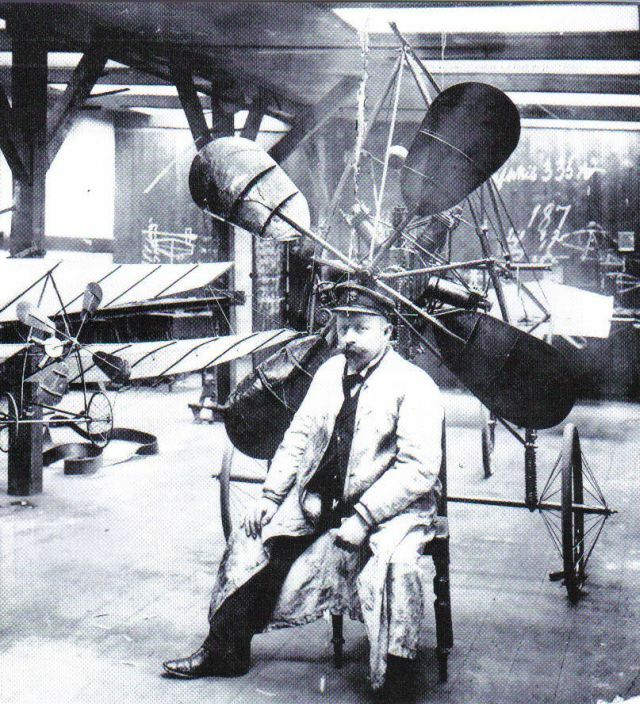 So, by 1906, he had all the elements required for powered, controlled, flight; 1) a light but powerful engine, 2) an extremely light aircraft and 3) a system of control. For his first experiments, he controlled the aircraft from the ground using wires, very much like controlling a kite. When he had all the kinks ironed out, he started the first man-made flights. He performed these with one wing-tip tethered to a pole, making it go around in circles. For this purpose, he had constructed a hangar and a circular cement runway on the island of Lindholm, in the South-East of Denmark. This was another innovation, as this was the world’s first runway. On the 12th of September 1906, Ellehammer took off in his second aircraft constructed, the Ellehammer II. He flew 42 m (140 ft) at a hight of 50 cm (20 inch). This flight took place a few days before the famous flight by Santos Dumont in Paris. The next aircraft made by Ellehammer, the Ellehammer III, was able to take off and land on grass. He made more than 200 free andcontrolled flights in this aircraft, without even a single mishap or crash. It is very interesting to note that Ellehammer had no knowledge of what the Wright Brothers had achieved in the USA, and that he came to the same conclusions as the Wright Brothers, roughly at the same time in history. Also, both the Wright Brothers and Ellehammer shared roughly the same backgrounds, in the bicycle/motorcycle business. The Ellehammer IV, was the first Ellehammer aircraft with fixed wings, spars, ribs and a “proper” curved wing profile. On the 14th of January 1908, he entered the record books as the first person in Germany to fly, winning an astounding 5000 Mark for his feat. He few 190 meter in 3 meter’s height. The flight took 11 seconds! The next aircraft, the Ellehammer V, was a flying boat. By 1909, he built his “Standard Monoplan”. This aircraft was used by Count Moltke, who tried to cross the Øresund, the straits between Denmark and Sweden. The Count did NOT win the prize. The Standard Monoplan still exists to this day. A replica of it was made by Kramme & Zeuthen, and used by Viggo Sylvest Jensens Flying Circus. By 1909 Ellehammer had obviously heard of the developments in France, and he lost interest in aircraft. Instead, he turned his attention to the helicopter, and by 1912 he succeeded in taking off in a helicopter of own design. The machine featured a counter-rotating propeller.